LED Light bulb has 10 lamp beads, can be changed into a single red, green, blue, pink, purple, yellow, colorful, etc. 16 different colors and a variety of self-flashing mode, adjustable monochrome brightness. By placing these lights on top of a disc golf basket shining down, they illuminate the entire cage. Play Frisbee is about 15 meters distance. 16 different static colors: Press the color button on the remote to select color. Brightness: Press up or down button to increase or reduce the brightness of static lighting. Dynamic color changing effect: Select from flash and strobe after selecting your desired color to achieve dynamic changing effects; select from fade and smooth to view colors changing in default order. 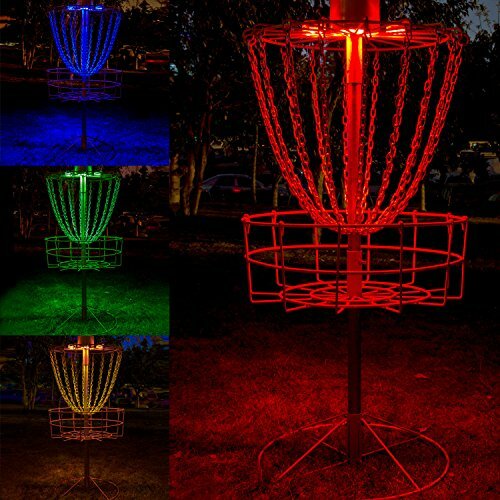 10 LED Lights: Placed on Disc Golf Basket, it illuminates every chain, illuminates the floor and is very bright. Multi Color: Designed with 10 RGB 5050 SMD LED bulbs. It has 16 different colors, 4 different color changing programs: Flash, Strobe, Fade, Smooth. Perfect for lighting up your disc for nighttime disc golf! Waterproof：Set of two, light up Disc Golf Basket Lights, A rubber gasket inside the threads makes it waterproof. It will not be affected when it is raining. Remote Control：Change colors, change color modes, adjust brightness by remote controller. Safety and Environmental Protection: Never fever, to avoid the occurrence of flame fire phenomenon. If you have any questions about this product by YiePhiot, contact us by completing and submitting the form below. If you are looking for a specif part number, please include it with your message.